Plastics market in GCC region is increasingly growing on the back of urbanization and developmental activities, with plastic manufacturing capacity reaching to 2.5 million tons in 2016. Polyethylene terephthalate (PET) accounts for largest market share of nearly 70% of the total engineering polymers. The major sectors in GCC region under high development activities are construction, transportation, electronics and healthcare, which contribute major share in the application of plastics. Manufacturing of polycarbonate (PC) acquires nearly 10% of the GCC engineering polymers, which has wide application in the construction industry. The growth of construction industry and other end-use industries are propelling the GCC plastics market. Goldstein Research analyst forecast that the GCC plastic market is expected to grow at a CAGR of 5.9% during 2017-2025, to reach the market size of USD 50.2 billion by 2025. Plastics market is an important segment of GCC chemical industry as it drives the chemical manufacturing at the secondary and tertiary level. GCC chemical industry is growing at a rate of 9% annually impacting the similar growth pattern for polymers market. Further, GCC region is focusing on specialized parks to tap the potential leverage of plastics industry, such as Rabigh Plus Tech Park, Sadara’s Value Park and PlasChem Park in Saudi Arabia; Khalifa Industrial Zone and Al Saja’s Oasis in UAE. On the other hand, the environment concerns will shift the plastics manufacturing trends towards sustainability, resource efficiency, cost and functionality due to ever increasing demand for plastics majorly in solar power sector, construction industry and packaging industry. Based on plastic product types, commodity plastics accounted to largest market share of 89% in 2017, with largest share acquired by Polyethylene (60%) followed by polypropylene (28%). Commodity plastics are widely used across multiple industries whereas; engineering plastics are used only where required functionality is of mechanical and/or thermal properties. Based on geography, Saudi Arabia accounts for nearly 65% market share in 2017 followed by UAE and Qatar. Over the past decade, Saudi Arabia polymers market has grown by 11% in terms of production whereas, UAE by 24% and Qatar by 5.5% with similar growth impact on the plastics industry. Over the forecast period, UAE is expected to grow at a highest CAGR of 6.2%. The report covers the present ground scenario and the future growth prospects of the plastic market for 2017-2025 along with the market players’ analysis. We calculated the market size and revenue share on the basis of revenue generated from major players in the GCC region. GCC Plastic Market Outlook 2017-2025, has been prepared based on an in-depth market analysis from farm market experts. 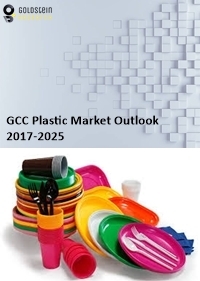 The report covers the competitive landscape and current position of major players in the GCC plastic market space. The report also includes porter’s five force model, SWOT analysis, company profiling, business strategies of market players and their business models. “GCC Plastic Market Report” also recognizes value chain analysis to understand the cost differentiation, pricing models to provide competitive advantage to the existing and new entry players. Our GCC plastic industry report comprises of the following companies as the key players: Qatar Plastic Products Company (QPPC), Saudi Arabia Basic Industries Corporation, Braskem SA, BASF SE, The Dow Chemical Company, Bayer AG, LyondellBasell Industries, ExxonMobil Corporation, Ineos Group AG, Arkema S.A., DuPont, etc.